I literally just used this as a motivational tool. "Go get a shower right now or I will eat your head." So I’m hungry right now. Really really hungry. Not starving hungry but I’ve forgone some snackage because I knew we were going out to eat with my brother. Adam just got home from work and didn’t get ready fast enough for me so I told him to watch as I was drawing and proceeded to threaten him with, “Go get a shower right now or I will eat your head.” And yes, that is a floating desk. Sorry for the Facebook-like status update to this post. But it just happened. Literally…in the literal sense, not the figurative sense that has seemingly overtaken the original function of the word. 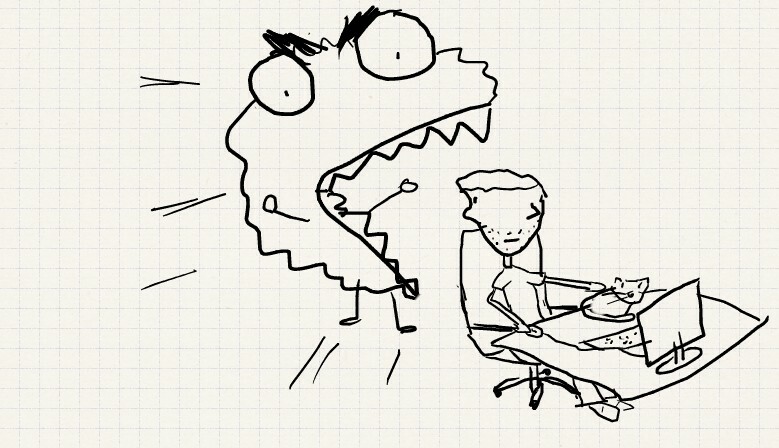 So I asked Adam what I should draw today…. Adam is a manly man.